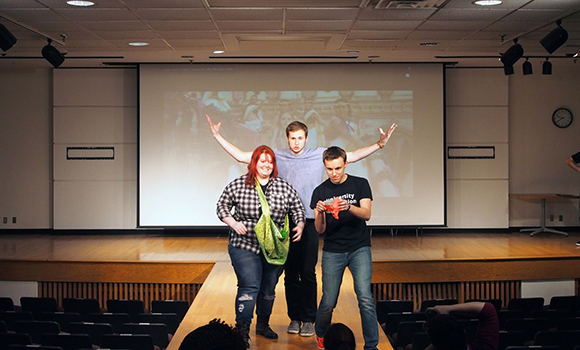 University Innovation Fellows shared strategies for student-led change in higher education at the James Madison University Regional Meetup in November 2015. At the James Madison University Regional Meetup, University Innovation Fellows share their insights and lessons learned from creating activities, events and spaces at their schools. Photo by Laurie Moore. 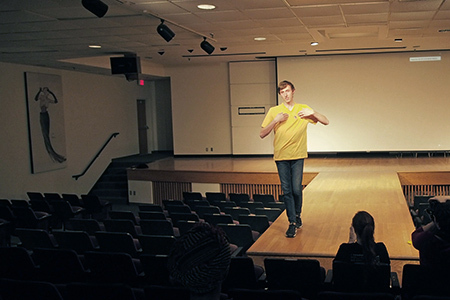 Students circulated the room, their voices echoing off concrete floors and high ceilings. 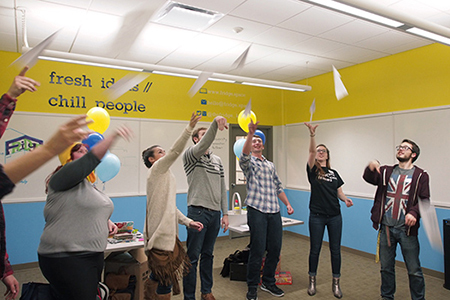 They wandered from one rolling whiteboard to the next, where their peers presented what they’d learned from creating activities, events and spaces at their schools. The presenters wrote insights on the whiteboards as they talked — a live poster session without paper or graphs. Instead of rotating to the next whiteboard when instructed, some students remained at the same board, taking detailed notes on the topic and asking follow-up questions. Many of the discussions extended over lunch and throughout the day. 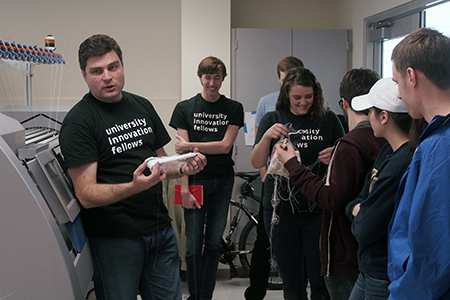 This showcase of activities was one of many highlights of the University Innovation Fellows Regional Meetup hosted by James Madison University (JMU) on November 14-15, 2015. Titled “Own It. Do It.” and held at JMU X-Labs, the meetup provided an opportunity for Fellows to connect in person and learn from one another about how to engage their peers around innovation, entrepreneurship, creativity and design thinking. The event, designed by JMU Fellows and faculty sponsors, was attended by 40 students from 13 schools in addition to JMU: Clemson University, Dalhousie University, Furman University, George Mason University, Grand Valley State University, La Salle University, Morgan State University, North Dakota State University, University of Portland, University of Virginia, Villanova University, Virginia Commonwealth University, and William Jewell College. Speakers and activities included a welcome from JMU President Jonathan Alger; an icebreaker with Outriggers, a student-led event facilitation group; a two-part design thinking challenge led by professor Justin Henriques and UIF program co-leader and Stanford d.school lecturer Leticia Britos Cavagnaro; a talk by Marty O’Neill of Corsum Consulting; and a tour of the Harrisonburg Printers Museum from museum owner and excavator Timothy Moore, a JMU University Innovation Fellow who helped design the meetup. James Madison University President Jonathan Alger welcomes the Fellows. Photo by Daniel Stein/djsphotovideo.com. Exchanging ideas was the thread that connected all of the activities during the event, as was discovering a community of like-minded individuals. After President Alger’s introduction, participants talked with Presidential Innovation Fellows Emily Ianacone and Steven Babitch, who discussed projects that required them to work on “problems not yet defined.” One such project resulted in a platform to facilitate more dialogue between diabetes patients and their health care providers. 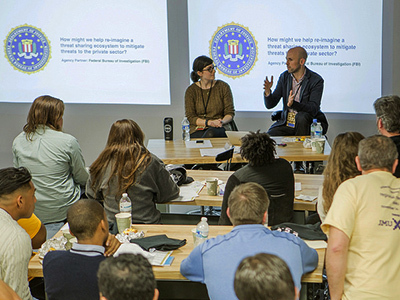 Presidential Innovation Fellows Emily Ianacone and Steven Babitch discuss their projects with the Fellows. Photo by Daniel Stein/djsphotovideo.com. The connections between the University Innovation Fellows and the President Innovation Fellows seemed to go far beyond the names, with both groups working to create lasting change: one in higher education, and one in industry and the nonprofit sectors. “The world around us is constantly evolving, and it’s important to have people who are creating change and evolution at large institutions like universities,” Emily Ianacone said. As the first of many sessions designed to strengthen their relationships with one another, Fellows participated in a team design thinking exercise. With the campus bustling with activity from parents weekend, meetup participants set out on foot to interview JMU students about challenges they faced on campus or in the community. 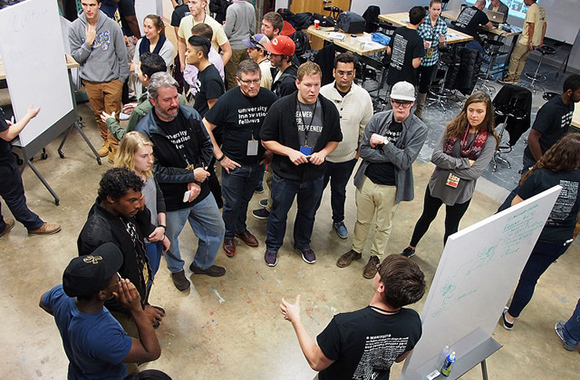 Later that afternoon, teams designed solutions and pitched their best ideas to faculty and administrators. This helped teams understand the different perspectives of all the stakeholders involved in creating change at a school. 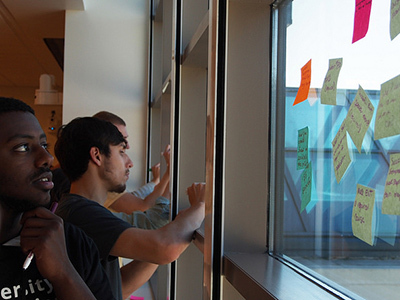 Fellows took part in a design thinking exercise to explore challenges faced by students on campus. Photo by Laurie Moore. Another session was the whiteboard presentation circuit, where students presented on activities they’d created including hack-a-thons, pop-up classes and makerspaces. 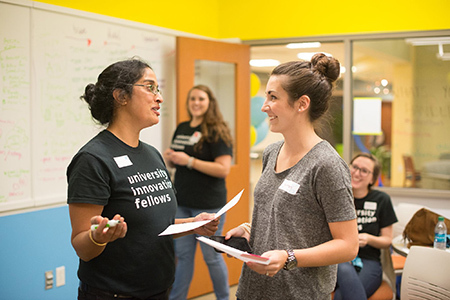 Fellows noted the value of these opportunities to learn from one another and build strong relationships with other students who are just as passionate and motivated as themselves. These personal connections lasted throughout the day as the participants explored three businesses that are redefining downtown Harrisonburg: the BlueHub coworking space, jewelry entrepreneur Hugo Kohl, and Pale Fire Brewing Company. Students who hadn’t known one another 48 hours earlier were discussing projects and how to implement what they’d learned at JMU back at their own schools. I had the pleasure of spending a weekend in the Kent State University Fashion TechStyle Lab with the University Innovation Fellows Program. 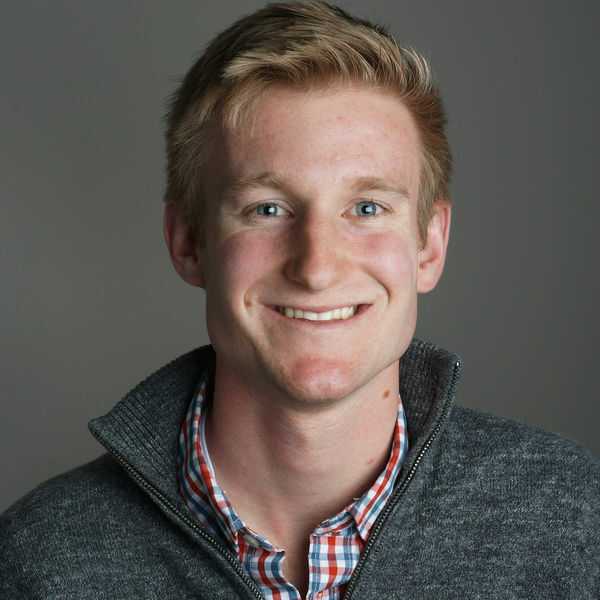 As an entrepreneurship major, creation is something I’m strongly interested in, but physical making and hands-on work have never been in my skill set. We were first given a tour of all the cool tech in the lab. 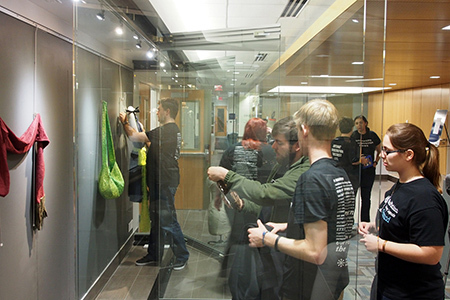 There was a laser cutter, a weaving machine, a body scanner, and a 3d printer, to name a few. Then, there was a demo time for us to learn basic skills that we might need during the makeathon. I chose to learn how use Adobe illustrator for the laser cutter and the basics of arduino. Next, we were sent off to create anything wearable. After fumbling around trying to make magnetic shoelaces for about 2 hours, I pivoted to making a scarf. This is when the magic happened. I looked at this clean piece of fabric and tried to picture the end product. This was the toughest part. I had to think not in three dimensions, but FOUR! How can anything be conceived like this? Not only did the piece have three physical dimensions, but I had to envision what it would look like after I flipped it inside out and factored in this motion associated with the time dimension! Luckily, the lab was full of experts who were willing to help to no end. This, to me, was the beauty of the experience. The willingness for people to share their knowledge and pass on their expertise was evident. With this help, it truly felt like anything was possible. I had no idea what I was doing at any given moment, but the people that surrounded me completed me and helped me achieve a final product. Creation is amazing: conceiving something, putting in the work and seeing it come to be is extremely rewarding. It’s always a learning experience because unforeseen obstacles always arise. Focus is powerful: You’d be amazed at how much you can accomplish in a few focused hours that you devote to a single project. You have more time than you think you do: We’re all busy. No one feels like they have free time and newsflash: you’re never going to feel ready to start something new! (For more on that, check out this Ted Talk.) You need to set time aside in the future to get out of your comfort zone and you will not regret it. More people need to try this! 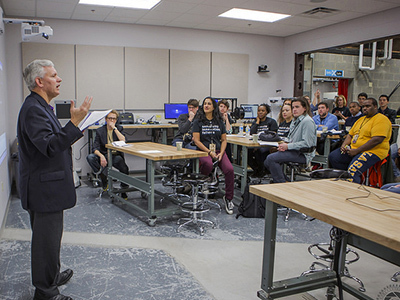 I’ve come back to campus with a renewed enthusiasm for encouraging innovation on here at University of Delaware. Overall, the Hackathon/Makeathon environment was incredibly inspiring. Not only was I able to create something, but I was able to witness everyone around me turn their ideas into reality. I feel gifted to have had this opportunity to travel and learn from so many talented people. 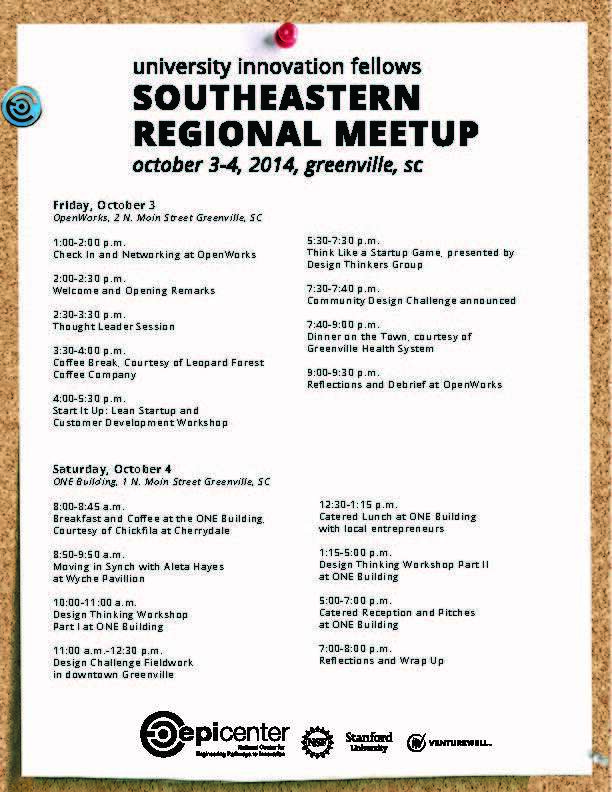 Thank you to all that made this possible and I’m looking forward to Delhack this weekend! 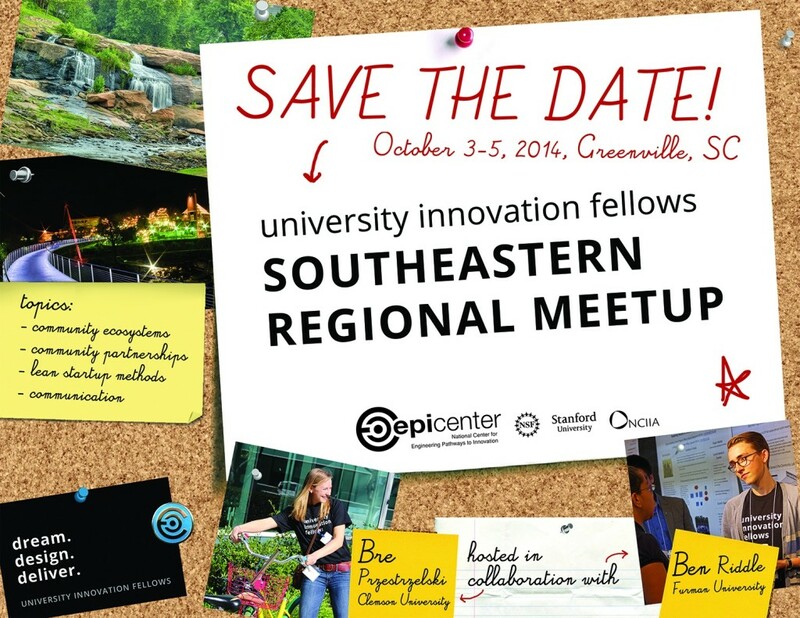 https://i2.wp.com/universityinnovationfellows.org/wp-content/uploads/2014/10/mid-atlantic-savethedate2.jpg?fit=675%2C522&ssl=1 522 675 Laurie Moore https://uifellows.wpengine.com/wp-content/uploads/2015/05/logo.png Laurie Moore2014-10-29 23:37:502016-12-01 16:49:27Fellows Mid-Atlantic Regional Meetup: University of Maryland and Washington D.C.